Hitoshi G. Sameshima, a Nisei veteran of World War II and a well-known leader and volunteer in the Los Angeles-area Japanese American community, passed away on May 15 at Huntington Hospital in Pasadena. He was 93. Born at the Women’s Hospital in Pasadena on April 13, 1921 to Chosaburo and Tsuna Sameshima, immigrants from Kagoshima, he was raised in Pasadena with his older sister Fumiko, older brother Kenji, and younger sister Fujiko. He enrolled at University of Southern California after graduating John Muir Technical High School. In February 1942, he was a junior at USC when his family was sent to the War Relocation Authority camp in Gila River, Ariz., where they were held for 3½ years. He was allowed to leave camp to attend college at the University of Denver in Colorado. In July 1944, shortly before his final exams, which he took early and passed, Sameshima was drafted. He was assigned to the Military Intelligence School in Minnesota because of his Japanese language skills. He served as a POW interrogator in the Philippines and was on a troop ship headed toward Japan when the war ended. He was sent to Tokyo as part of the occupation forces as a translator and court interpreter for the 8th Army Judge Advocate General during the war crime trials. While serving in Tokyo, he met Utako Yanagihara, whom he married in August 1947. They moved to the U.S. in 1948 and settled in Pasadena, where they had two children, Janet Sachiko, who died shortly after birth, and Linda Michiko. Both Utako and Linda predeceased him in 2012 and 2011, respectively. For 38 years, Sameshima worked for Los Angeles County. He retired in 1985 as a supervising deputy purchasing agent. One of his responsibilities was to purchase material and goods for all of the county’s hospitals. In 1971, he had just completed work on the new facility at Olive View when the Sylmar earthquake struck and destroyed the buildings. He had to personally inspect the damaged structure to verify that the all of the contents had to be replaced. He remembered crawling into the wreckage and being concerned that there would be an aftershock while he was inspecting the interior of the building. Sameshima was active in many organizations, often as president. They include the MIS Club of Southern California, the Japanese American National Museum, where he was a docent for 24 years, the Go for Broke National Education Center, the Crown City Optimist Club, and the Pasadena Japanese Cultural Center. He was honored as a Nisei Week Pioneer based on his many years of community service. Among his other honors were Volunteer of the Year at JANM, Cherry Blossom Festival Community Treasure, and the Pasadena JCI Outstanding Service Award. In November 2011, Sameshima was among a group of Nisei veterans who received the Congressional Gold Medal at a ceremony he proudly attended in Washington, D.C. The following year, he participated in a Congressional Gold Medal Ceremony in Little Tokyo. He also received an honorary bachelor’s degree from USC in May 2012 along with eight other Nisei former students whose education was interrupted by the internment, and was an avid Trojan. Sameshima participated in the Nisei Week festivities by representing the Go for Broke and MIS organizations and dancing in the parade with fellow JANM volunteers. He was a long-time fan of the Los Angeles Dodgers and attended games at the Coliseum and Dodger Stadium. 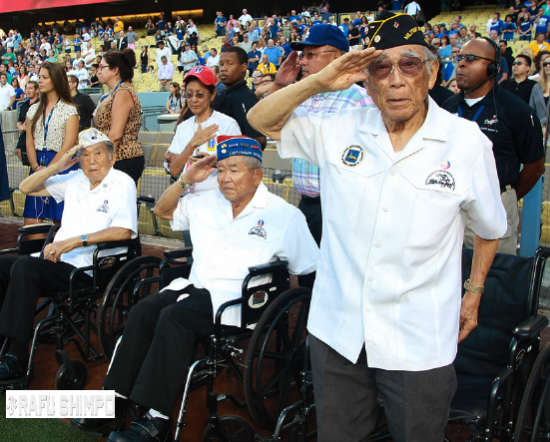 In July 2013, he joined two other Japanese American World War II veterans to throw out the first pitch at a home game against the Colorado Rockies. It was a great honor and his pitch reached the glove of his Dodger catcher, Scott Van Slyke. Asked by his niece a few years ago to name the three most important achievements of his life, he answered without hesitation — graduating college, serving his country in the military, and participating in his many volunteer organizations. “Sameshima began volunteering at JANM in 1990. His regular day of service was Friday, when he could be found giving docent tours to visiting school groups. He also came in on weekends to give Japanese-language tours to adult visitors from Japan. As a proud veteran, Sameshima served as president of the MIS Club of Southern California for many years and spoke on many JANM panel discussions about his wartime experiences. Don Nose, executive director of the Go For Broke National Education Center, expressed condolences to Sameshima’s family on behalf of the GFBNEC Board of Directors and Board of Governors: “Hitoshi … patriotically served his country as part of the Military Intelligence Service. He chose to serve his country despite the broad-scale incarceration of all JAs residing on the West Coast and also initially being denied the right to serve. “Using a bit of psychology, I began to talk about how I liked Japanese songs and I sang a Japanese song, ‘Futari wa Wakai’ (We’re Both Young). He started to smile and I asked if he would teach me a Japanese song. After talking a while he started opening up … telling everything, including the fact that he was glad to hear the war was over. “When I informed him we would be sent to Japan for the occupation, he started to tell of all the nice places to visit, not knowing how much of Japan had been destroyed by bombs, fire and the atomic bombs. “Another episode that I cannot forget is seeing, after arriving in Japan in October of 1945, the starving and elderly so weak some could not even stand. I was transferred to 8th Army Headquarters Judge Advocate section to work on the B Class war crimes with the Criminal Investigation Detachment (CID) along with three other Nisei. We were housed in the warehouse of the silk mill in Yokohama. “I cannot forget or erase from my memory seeing Japanese women, some with babies on their backs, scooping the leftovers that the G.I.s dumped into the garbage cans after meals. The sight of one lady scooping the slop with a can and giving it to the baby she carried on her who had scabs all over its face, body, and arms brought tears to my eyes. We of Crown City Optimist Club will miss our dear, loyal friend of Hitoshi Sameshima. and a highly respected friend to all…. God bless and speed to your journey to be beside your loving wife and daughters, Toshi.